I am getting ready to embark on a big home project, one that his been on the back burner for over thirty years! That is the finishing of my laundry/utility/pantry room. It is an extremely busy, well used room and it is still unfinished. The finishing of it will have to be done by professionals because it needs to be done quickly. We can't live long with the water pump and water heater disconnected as flooring is laid and sheetrock installed. So, I am getting prepared for contracting a big disturbance in our lives which hopefully will end in something beautiful. 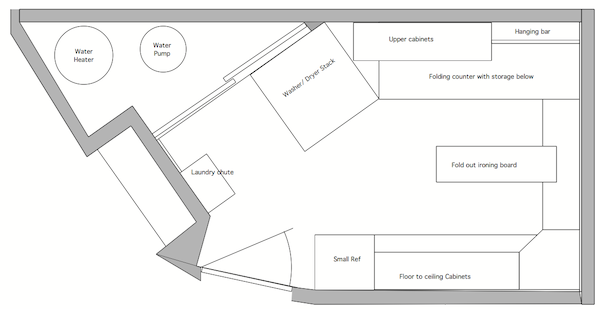 I have started planning and you'll need to understand a few things about our home. First it is creatively shaped. I designed it and David and I built it ourselves (with much help from my Dad) back in 1978. Talk about a learning experience! Much of it was unfinished when we moved in and we finished new areas as kids arrived. 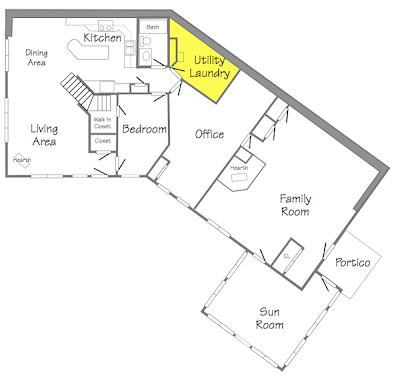 Here is a floor plan of the first floor. See what I mean when I say "creatively shaped?" The back wall is a berm wall and below grade. The house was designed as a passive solar home and we heat using wood harvested from our property. The berm keeps the house cool in the summer and warm in the winter. I have highlighted the room I will be working on in yellow. 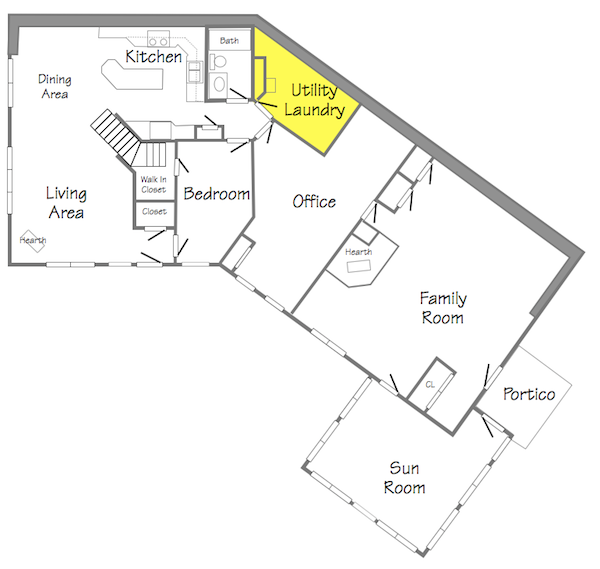 The house is on a slab which works as a heat sink so the utility/laundry room is my "cellar". It is still concrete wall, concrete floor and studding. Here is my current plan for it. 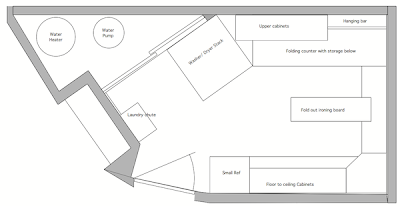 Ever plan for a room shaped like this? 1. Relocating the water heater, water pump and pipes to better use the space. 2. Hide the utilities behind a removable wall - removable for maintenance reasons. 4. Add flooring - probably just vinyl. 5. Get a stacked washer dryer. To start I need some more advice. I 've got a dream but I need to talk with a plumber to discuss reality! That is the next step. Right now I have been spending my project time relearning Intaglio, a floor plan program and Google SketchUp. I do plan to create a 3-d drawing before moving forward. I expect I'll be sharing stories with all of you! I see that your laundry room is not too far from the kitchen. Do you have a pantry of adequate size? You might want to consider some open shelving for pantry extras (paper products, sugar, flour, cake mixes, cans of soup, bigger bowls that don't get a lot of use, but are necessary, etc.). This looks great, nice project!